One of our aims in trading the financial markets is to make sure that we're trading in the right places on the price chart. Places which make sense when viewed from the perspective of the psychology of the market participants. Places which make sense when viewed from the perspective of the structure of the market. 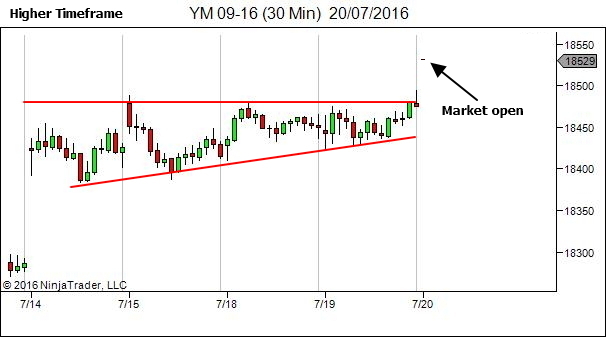 Today we look at one of these places – the retest of a point of structural change. We've addressed this concept briefly in the past. If you haven't seen this prior article you may wish to review it first. 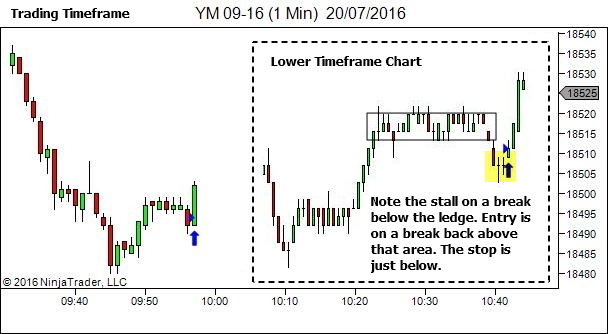 All examples in that article dealt with structural patterns on the trading timeframe. But the same concept can be applied across a much larger time scale, with trade opportunity found as markets retest a point of higher timeframe structural change. That was the idea behind the following trade. We'll start by examining a much higher timeframe in order to see the structure develop over the prior four days. 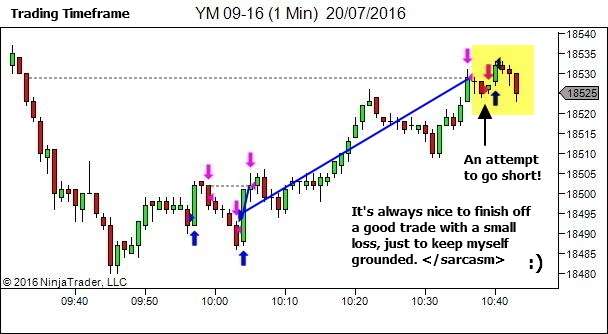 Volatility contraction is never fun to trade. Monday was slow and boring. Tuesday was worse. 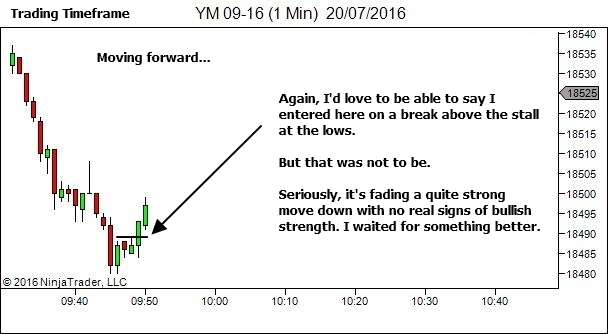 But in the back of my mind at these times is an expectation that this volatility contraction must end at some stage. 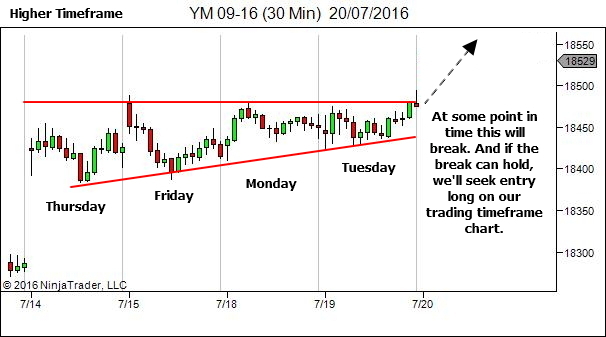 So let's move forward to Wednesday to see how the breakout eventually occurs. 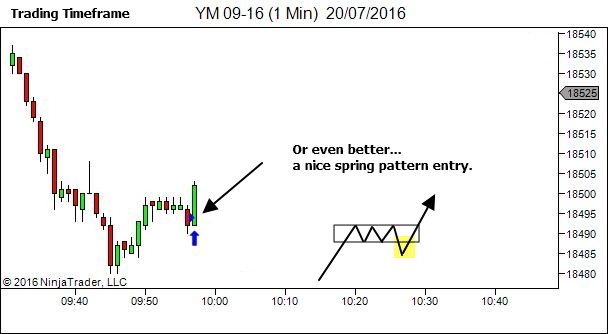 And to see whether or not it then offers us a nice BPB setup entry long. Let's move ahead 30 minutes into Wednesday's session. From a structural perspective, this is a beautiful place to be seeking opportunity long. 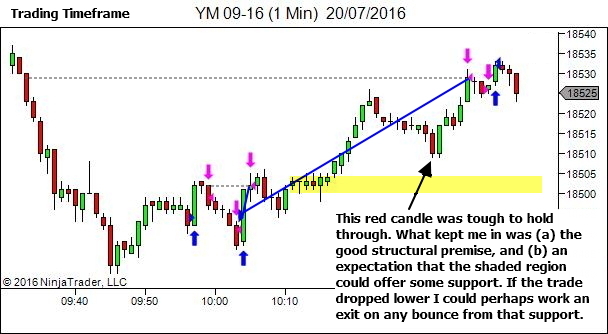 Previous resistance often provides support once broken and retested. From the metagame perspective, it's also a beautiful place to be seeking opportunity long. 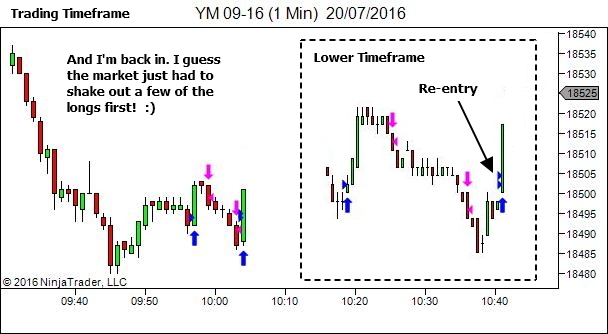 Anyone with a bullish bias who missed the overnight breakout has now been gifted an ideal "second chance" entry opportunity. 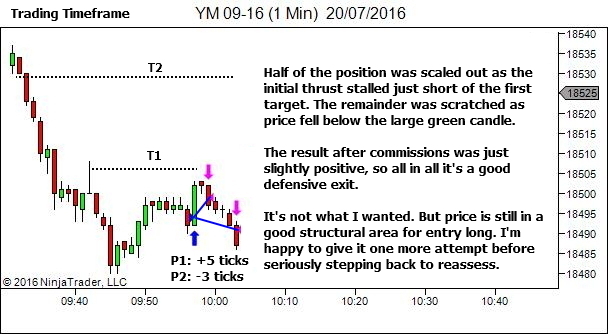 Those already holding a long position have been provided an ideal scenario to add to their position. 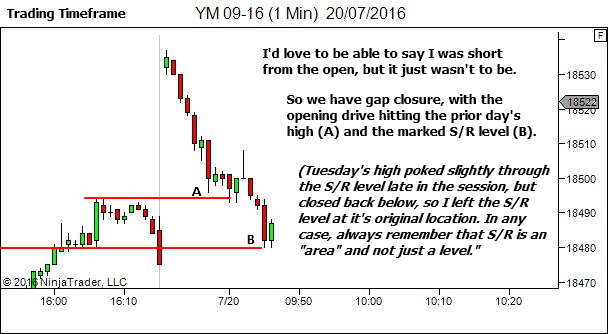 And for those who managed to get short from the open on Wednesday, the market is at the ideal area for profit taking (ie. buy orders). There is good reason to be buying here. 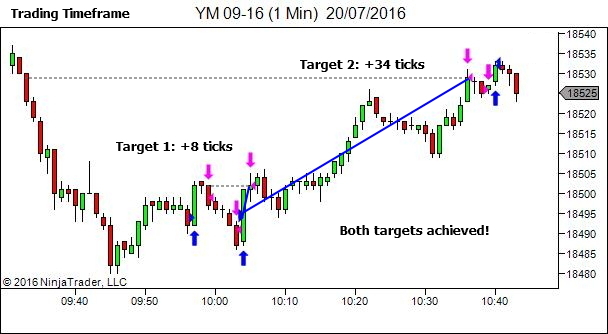 Let's look to the trading timeframe to see how it played out. 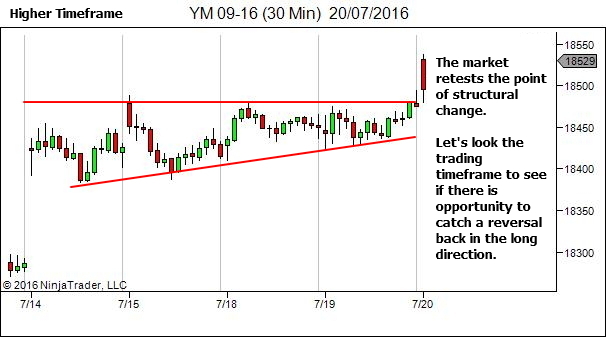 One place I always look for trade opportunity is on a retest of a point of structural change. it would certainly require a great understanding and analysis of market to enter long not just once but twice after such a sharp fall, and also confidence. 1) Why would you not exit at the touch of that support area? 2) When there is bounce from support, why wouldnt you expect continuation of the upmove? Well since it’s been awhile, perhaps I can help answer your 2 questions. 1) I believe Mr Beggs was expecting there to be enough buying power at the shaded region to produce another move up, due to the strength displayed upon the breakout of that area ( look at the consolidation of price on the left side of the yellow area) combined with the weakness of the pullback back to the yellow area. 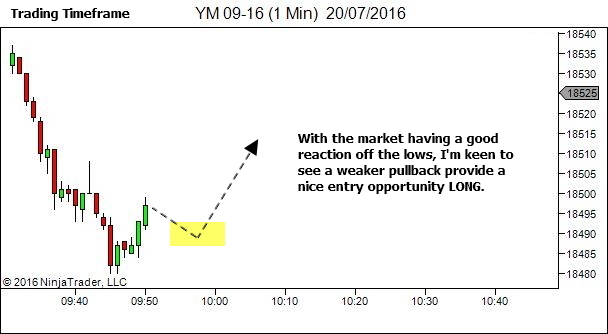 Others who missed the original breakout long could be wanting to get back in upon seeing that same weakness. This is probably why Mr Beggs would not just exit at the touch of the level, in order to give the level a chance of providing support and another rally. The stop would no doubt be just a pip or 2 below the support level. 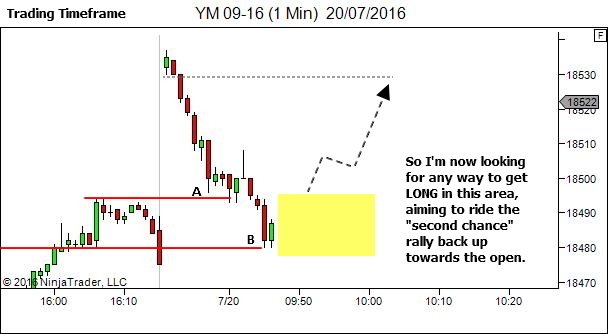 2) if what I wrote in #1 should happen and there is a rally you would then want to see what the strength of that rally is. If you have a series of strong closing candles you might wanna give price a chance to reach new highs, but if you see weakness such as neutral closing candles showing upper tails then you may want to work the best exit possible above the yellow area. Anyway I hope that was helpful from one student to another. Mahesh, sorry for not having replied earlier. Somehow I seem to have missed this comment. I’m not sure how. If that happens again, send me an email. Marcus, thanks for adding your thoughts. Much appreciated. And your comments are exactly 100% right. I would expect the support area to at least have some reaction. If it was strong I’d hold the trade for a push to new highs. If it was weak, I’d work an exit as best I could. If I was completely wrong and there was not reaction, I’d still be able to get out at no worse than breakeven.